It goes without saying that Madhuri Dixit is the dancing diva of Bollywood. With her gracious dance moves and impeccable expressions, the gorgeous leading lady of the showbiz world has been ruling our hearts since forever. The desperate wait to watch Madhuri perform a classical number now nears an end, as the star is ready to sway away her fans with her classical track “Tabah Ho Gaye” of Kalank. However, one look at the posters, and we are taken back to the time when she played the beautiful Chandramukhi in Devdas. The similarities scream for themselves, but the actor has something else to say about it. 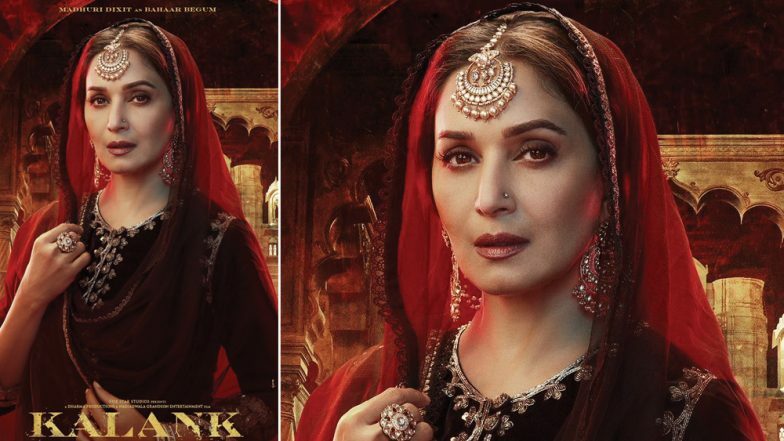 Kalank Song Tabaah Ho Gaye Teaser: Madhuri Dixit Looks Gorgeous In This Video That Gives Us Major 'Maar Daala' Vibes! “It has a very balanced kind of choreography where it's not over the top where she's like 'Oh common I'm going to dance'. Also, it comes at a very emotional point in the movie. It's a slow song. It's an emotional song. The whole story and the characters come together in the song. So, it's not just a song but it's also about the story that's going around it. So all that had to be kept in mind,” she further stated. Alia Bhatt Reacts to Her Weird Skeletal ‘Hand’ Scene From Kalank Trailer; Reveals The Error Won’t Be There in the Movie. The multi-starrer big-budget period film Kalank is based on the pre-independent era. Helmed by Abhishek Verman, the movie is bankrolled by Karan Johar’s Dharma Productions. Apart from Madhuri, the movie stars Alia Bhatt, Varun Dhawan, Sonakshi Sinha, Aditya Roy Kapur and Sanjay Dutt in lead roles. Kalank is slated to hit the theatres on April 17.